Enjoy your workout overlooking the YMCA Hawker sports field. Our Health & Wellbeing centre is comfortable and welcoming ; its modern gym has Precor equipment and is divided into two areas with resistance equipment to one side and cardio-vascular equipment to the other. Fitness instructors are on hand to offer advice and guidance as well as take you through the Get Started programme, a series of five one-to-one appointment designed to motivate you to achieve your fitness goals. The gym is equipped with TVs on most machines and cardio theatre, so you can work-out to your favourite music or TV programme. After your workout, you can relax in the steam room. Classes are included with membership. From Zumba to Pilates and Line Dancing to Insanity there is something for all ages and levels of fitness. View our timetable or read more about the range of classes. Regular exercisers will save money by joining with membership packages starting from just £34 a month. Pay-as-you-go options are also available for the gym and group exercise classes. Please note, pay-as-you-go price increase: standard session prices from £7.00. The gym, its equipment and the whole Centre, is fully Inclusive Fitness Initiative accredited, meaning that facilities are fully accessible and suitable for people of all abilities. Do you suffer from an injury or illness, and would like some tips on how exercise can help improve your physical and mental wellbeing? Our highly qualified fitness instructors can help prevent further injury and improve your wellbeing, with a customized training programme tailored to your needs. Ask our staff about the 12 session Get Active exercise referral programme and pick up a leaflet from your GP. YMCA Hawker has three tennis courts that are available to hire and runs a programme of adult and junior tennis lessons. For more info about the Tennis at Hawker, including courses and timetables, click here. There are basketball practise hoops, a bowling green and football pitches for hire. Call in at the centre to enquire about prices. All members holding annual and monthly memberships can use all our three YMCA LSW Health & Wellbeing sites across Kingston, Surbiton, Hampton and Wimbledon. Read more about the membership system update here. 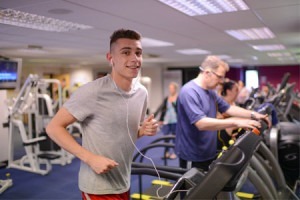 The gym at YMCA Hawker is run as a social enterprise and all surpluses are used to fund YMCA LSW’s community projects. By using our facilities you are helping us to help local vulnerable people.